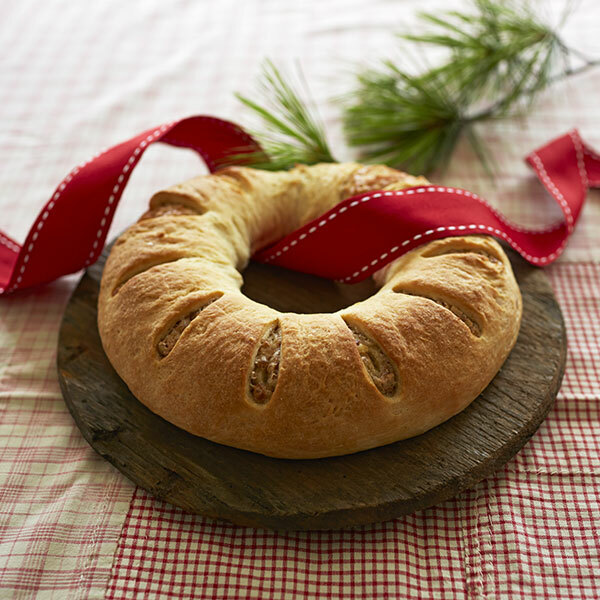 Stollens are a traditional German fruit bread often made during the holidays. With this stollen recipe, you'll get a more nut-flavored and less fruity bread. The recipe makes 3 stollens—1 to eat, 1 to freeze and 1 to give away. These stollens can be made ahead and frozen. When you are ready to serve a loaf, allow it to thaw to room temperature and then add the icing. Soak yeast in warm water and 1 tablespoon sugar. Mix together egg yolks, 2 remaining tablespoons sugar and salt. Add milk and yeast mixture. Alternate adding flour and melted butter into the egg mixture. Form dough into 3 balls. Wrap in plastic wrap and refrigerate for at least 6 hours or overnight. Beat 3 egg whites until fluffy. Add sugar and nuts. Add evaporated milk to get to the spreading consistency you want. Roll 1 ball of dough into a rectangle about 13 by 9 inches, between ⅛ inch and ¼ inch thick. Spread ⅓ of the filling on top of dough. Roll, jelly roll fashion, and seal ends into a ring. Make slits in top of stollen in several places. Bake at 375°F for 30 minutes or until evenly brown (but not a dark brown). After stollen is cool, mix some powdered sugar with a little evaporated milk to make a thin icing that can be drizzled over the top of the stollen, but not so thin that it all runs off. Decorate with halved maraschino cherries. Tip: You can freeze the stollen before icing it. When ready to serve, allow it to thaw to room temperature and then add icing.